The Sheep of Paradise — Wayward Roots & Co. The white pickup, its bumper adorned with an elk antler, rambles along the valley highway. Meghan Purcell at the wheel, myself in the passenger seat, and Carly Schoen, a local denim embroiderer known as Mayday Denim, warming the jump seat in the back. Our sack lunches lying on the dash with the expanse of Paradise valley and its rising peaks encompassing our view. I arrived in Livingston on a weekend in mid-October, and today's destination led us to Pray, Montana. We would be joining Barb and Per Gunness of Wolf Ridge Icelandics, Meghan's local wool supplier for her fiber art (see interview), to lend a hand for their fall shearing. We are running late, each of us weary from late nights and whiskey, but when it comes to the fast-paced days of sheering extra hands are always needed, late or not. And, we've all had enough coffee to ignite the senses for the work ahead. Our arrival scene was a long driveway lined with small flocks of freshly shorn sheep meandering away from an open garage. Micheal Jackson was ablaze on the radio, the buzz of clippers and a round of joyous hellos from neighbors, friends, and family on hand to aid a smooth and successful day. All present were assigned a job of assistance. Sweepers, collectors, handlers, shearers, and Barb; a hearty, joyous woman whose charisma filled the room as she oversaw the progress of the day. Barb's original background is in Wolf Biology, a field she worked in while living in Minnesota where she grew up. As well as being an animal lover at heart, these characteristics contributed to her knowledge and expertise upon transitioning to sheep farming. The farm was first established as a family endeavor lead by Barb's father in 2000 (date according to their Facebook page). Upon walking their property, you will encounter jolly border collies, barn cats, two yaks they keep as predator protection, horses, a trip of goats (their newest addition for milking), and of course, the sheep. Sheep farming is a lifestyle, and though grueling at times, is one she has fallen in love with. Through their holistic practices, the sheep are pasture-raised on a rotational grazing system. Rotational grazing is a system that allows natural growth recovery while maintaining quality to the pastures and its soil. Barb admits that many fellow ranchers throughout the valley questioned this practice, but she feels time has been the ultimate proof. It is true that this method isn't considered convenient and there is for more labor involved in transporting the animals to a new location. The benefits lay ahead, years from now, when those pastures will continue to hold their structure and provide a healthy food source for the animals they serve. As the pace of the shearing presses hours into moments, we move into the afternoon without much regard. Barb has just returned from retrieving the remainder of the flock, the yearlings due for their first trim. This allows for a short break in the line, cans of fresh Coors were passed around and bags of Doritos and Oreos brought out. The down time allowed for a bit more socializing and making the acquaintances of those present. The conversation led to discussing the controversy behind sheep shearing, primarily referencing organizations that spread photos of physically abused, mutilated sheep, and gashing wounds from the shearing device as the norm of this practice. Their goal is often to deter the use and purchase of wool as a mainstream material with hopes of sparing the sheep from this ritual. Barb just shakes her head, explaining that no respectable farmer, particularly one such as Wolf Ridge that holds it's farm to high ethical standards, would be treating their animals in such a way, but it is also naive and disrespectful to say that these outcomes are standard in a sheering. As Barb puts it, it would be negligent to not sheer the animals at all. To omit the removal of their excess wool in a reasonable amount of time would cause the animals to overheat in summer months, cause the wool to dread, becoming entangled with straw and burs that pulls the skin and can cause limited mobility, and increases the possibility of flystrike. It would also cause difficulties for them to excrete their droppings, which would also become caught in the wool. And for farmers such as Barb, the quality of the wool that is removed is held to the highest of standards, and cleanliness being a key factor in its potential to be purchased as a material for further production. 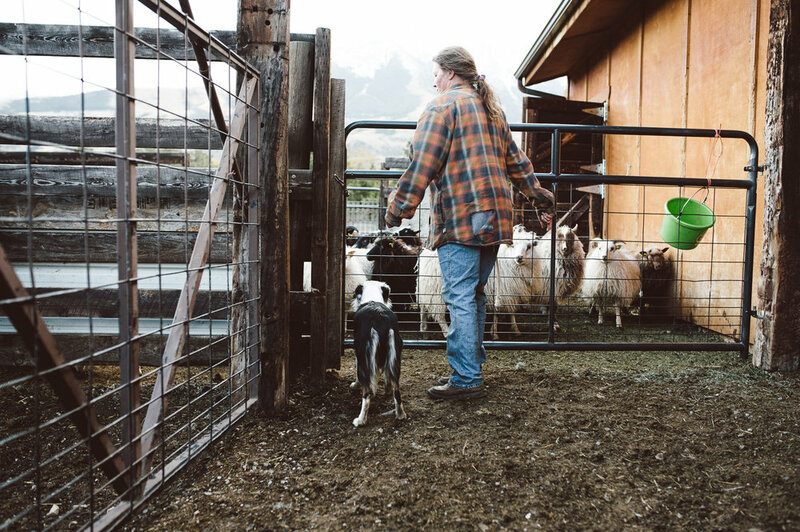 For many farmers, Wolf Ridge included, a successful sheering requires the least amount of distress on the animals as possible, which also calls for strong, quick hands. Their goal is to remove the fleece in as complete structure as possible without causing harm or prolonging the discomfort of the animals. On this particular day Per, Barb's husband, and Ryan Keyes, a prominent local shearer, spend hardly more than 30 seconds with each sheep, quickly bringing it from the shoot, positioning, removing it's fleece with machine shears, and releasing it to the front yard. It is impressive to watch their swift yet efficient movements, hardly pausing beyond the time it takes to prepare the next in line. Meanwhile, the wool is swept off the platform to be bagged, labeled and set aside until it is sent out for cleaning and processing where most will be made into yarn, roving, batting, or pelts. The wool from the Icelandic sheep strikes me as unique, the longer fibers ranging in neutral tones from soft blacks and grays to golden browns and creamy whites (the signature aesthetic of the felted hangings by Meghan Purcell). I am not alone in this thought as Barb mentions their appearance is often noted by visitors and passersby, a feature that was also highlighted when selecting the Icelandics as the farm's preferred breed. They are also prized for their meat, which has a delicate texture and taste. "Our customers, including skeptical lamb tasters, love our lamb." 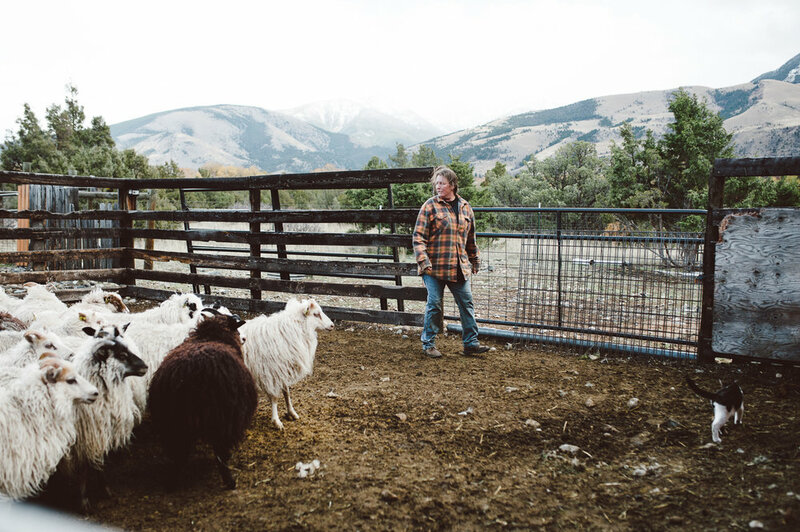 Wolf Ridge's lamb is utilized by a growing range of chefs throughout the Paradise Valley, Livingston, and Bozeman region. As the break came to a close, we all began making our way to our previous positions to prepare for the final portion of the flock. As Barb was moving the yearlings from their trailer to a small paddock off the side of the barn, she beckoned us to follow her. Moving to the paddock on the side of the barn with one of her younger border collies, whom was her current trainee, earnestly at her side. At this moment, the sounds from the hustle of the sheering within the barn peeled away. Barb entered the paddock, the dog at her still at her side, and walked the outer perimeter of the flock, triggering there natural grouping response. Barb then began giving directions to the pup. Not harsh or aggressive commands, her tone and body language were void of any excitement. She spoke with her voice in a hushed whisper, the exchange kept directly between the two of them, the dog responding to each spoken and unspoken command. The paddock remained silent as they moved the flock, their movements also calm and methodical. And as fluidly as it had all begun, the sheep entered through the open door on the side of the barn, leading them through the chutes to the shearers. It was a hypnotizing display; this delicate dance of power, cooperation and teamwork. "You must come back for lambing! We will have little baby lambs running around everywhere." Barb remarked as we reached the shearing's end. The sheep were settling within their flocks across the yard, huddled together to keep warm in the fall chill. A few weary workers wandered off for a break from the days events. Clean-up had begun. A hot meal consisting of homemade corn chowder and side dishes was being set up for the group of helpers, a small consolation for their labor, but one that will certainly be reciprocated in other fashions. Meghan invited me to join her on this day to meet Barb and to see and experience the farm that not only provided the wool for her art but has also become woven into her own community. 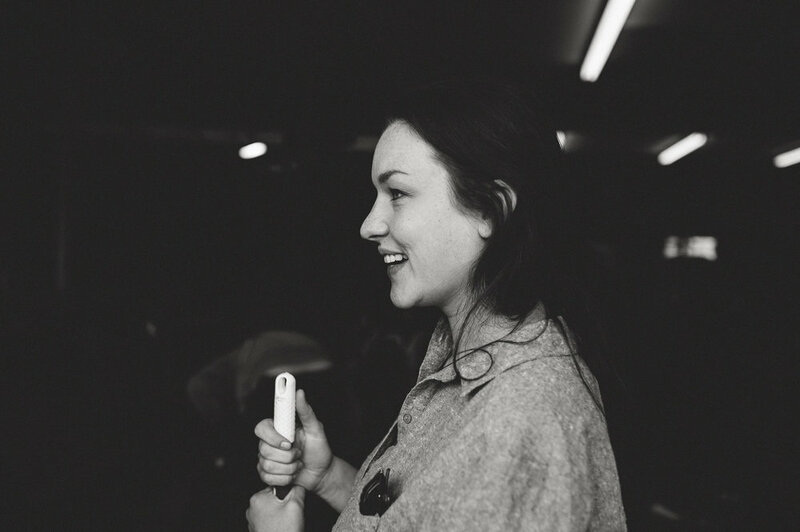 Meghan talks of being drawn to the tones and textures of the wool that instigated its use in her art. But I think its fair to say that this place, these sheep, and these farmers are also embedded within that draw. This farm is not just a resource for her materials, for wool can be purchased from many different outlets. There is an unspoken bond to its source, one that has cultivated a mutual relationship of support and loyalty. And that right there is an integral key in propelling the livelihood of these smaller establishments; the understanding that our responsibility to those within our communities is pivotal to sustaining and upholding each of its individuals. To grow and evolve, to fall and rise together.